Bronx artist Natalie Collette Wood presents ‘moss murals’ in the Montefiore Courtyards for Summer 2015. The Green Yard Project is made entirely from live moss that the artist collaged and painted directly onto the walls, creating an imaginary garden. The installation provides a fictional environment that promotes green spaces, nature, and health for Montefiore patients, families, staff, and the surrounding community of the Bronx that can be sometimes hard to find. Wood’s work questions how nature and urban environments interact with one another and cohabitate together. The Green Yard Project celebrates the throbbing, pulsating, force that is fantasy, nature and sculpture together. “Swallowed By Nature” uncovers an outdoor installation by Bronx artist Natalie Collette Wood that explores the relationships between home, nature, and urban environments. The installation will include a series of sculptures and a moss mural on view at the Montefiore’s Wakefield Campus during the summer of 2016. 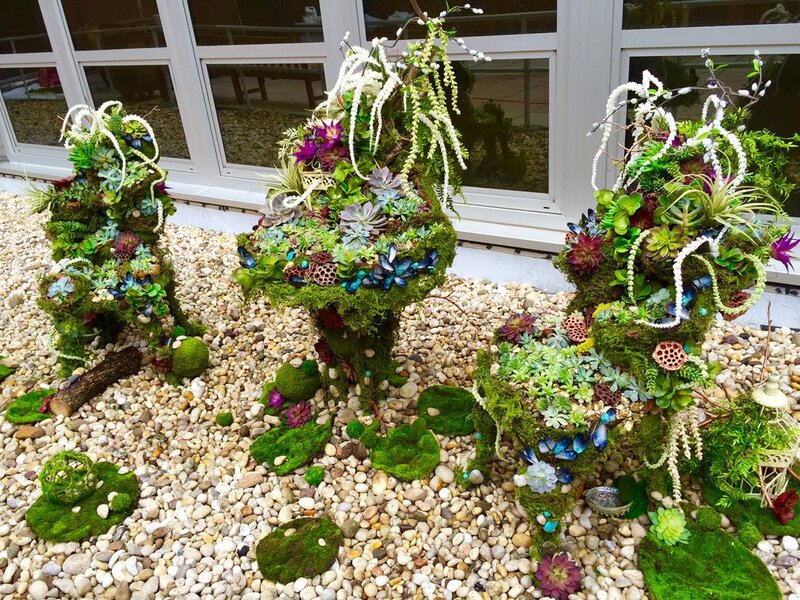 “Swallowed By Nature” is created from found objects that are overcome by natural materials such as succulents, moss, air plants, and reclaimed wood to create a whimsical dance between urban and natural environments. The installation includes a moss mural that creates a textural landscape that climbs the walls of the outdoor space that extends the dance even further. Wood’s work examines how nature and urban environments interact with one another and cohabitate together while celebrating the enchanting and captivating force that is fantasy, sculpture, and the natural world.